Saturday, July 2nd, 2016 from 8:00-11:00am. We hope that with you joining us, we can chat about the lake over breakfast. Recently it seems a feeling of complacency has settled over the lake, as we are not having any big issues. Cyano Bacteria did not bloom last summer, but we saw signs of it growing. Weather, wind and or temperatures might have played a part for not actually having a “bloom”. Thankfully, Milfoil has not been detected in our lake yet. We continue to work hard to improve water quality but have a long way to go. We need your help! Bring your family, friends and anyone else that might care or have an interest in what’s going on around the lake (or just looking for some good eats in a beautiful spot). We do plan to have an array of Board Members, Linda Schier of the Acton Wakefield Watersheds Alliance and Sally Soule of the NH DES – Watershed Assistance Section to help answer any questions. We have some exciting plans for this summer. Directions and details can be found below. Come by boat, bike, car or foot to our house at 112 Remick Road, Effingham. The annual PLA Breakfast is once again being hosted by Carl and Donna Davis. All of your lake neighbors, friends and their families will be there, we hope you attend too … eat your fill of delicious homemade goodies along with breakfast staples like eggs, sausage, ham, pancakes, etc. For the fourth consecutive year; walk, bike, drive or boat to Remick Road for the breakfast social gathering of the year. Enjoy a delicious assortment of food while visiting with friends and catch up on what’s happening while enjoying the lake this holiday weekend. Bring the whole family and give the cook at your camp the morning off! We have takeout for boaters wanting to float while they eat, or stay and eat at one of the many tables set up in the yard. Last year we had over 200 happy and satisfied attendees – looking to serve 300 this year. If you haven’t come before, please give it a try, if you’ve enjoyed this event on a regular basis, tell your neighbors. Proceeds from this event support the Province Lake Watershed Plan. Don’t miss it – and come very hungry! To further help the lake, you might want to bring extra cash to the breakfast. We will have new Province Lake T-shirts, Sweatshirts and Hats for sale, along with an opportunity to become a PLA member for the very reasonable membership fee of $25. 100% of all money raised by the PLA goes in our fund for water testing, Lake Host ramp staffing, and our matching share of the project costs done via our State/Federal grants. Only two weeks away …. Carl and Donna Davis invite you to join them and your lake neighbors, friends, and families for the annual PLA Breakfast. For the third consecutive year, walk, bike, drive or boat for a wonderful breakfast, they’re right around the corner. Enjoy breakfast, and visit with friends, catch up on what’s happening without leaving the lake on a busy weekend. Bring the whole family and give the cook at your camp the morning off! We have takeout for boaters wanting to float while they eat, or stay and eat at one of the many tables set up in the yard. If you haven’t come before, please give it a try, if you’ve been and enjoyed, tell your neighbors. Proceeds from this event support the Watershed Plan. Don’t miss it- and come hungry! After the success of last years tournament, we are again going to have our second golf tournament. We have moved it to a Saturday this year in hopes of getting more of you that are around on a weekend. And that date is July 26, 2014. So, grab your friends and family and come on out for a great day of fun. You do not have to be an avid golfer to have fun in this event and you also don’t need to have your own foursome … just sign up using the attached form and you are sure to have a good time. As you can see from the attached, your company can also be a sponsor of the event and get their name proudly displayed and recognized .. so, if you know who in your company to forward this on to, please do. Mark your calendar, get some clubs and friends and come out to support your lake and have fun while you do it. How Do I Get to the Breakfast on July 6? Turn left out of PLGC driveway onto Rte 153, heading towards the lake. Lake will be on your right, take first right onto Bonnyman Rd. Go 1.5 miles then turn right onto Remick Rd. Go .5 miles, past Province Shores campground. Bear left as you come closer to the lake again, we are the 5th house on the right. Rust siding with the garage close to the road. Davis 112 Remick Road There will be signs up that day at corners. We are located in the middle of the shore that is directly opposite Rte 153 (right of the Province Shores Camp Ground). Look for the PLA Breakfast sign (it will look something like the photo below). Our dock and the docks on either side of ours will be available for use. Nice sandy bottom no rocks to worry about. Come in slow, there will be help on hand. Let us know if you are staying or there to pick up “take out”. Hold the date and get your golfing buddies ready for the 1st Annual Province Lake Association Golf Tournament. A Benefit Event to help protect and improve the quality of Province Lake. Whether you’re a golfer or not, come on out and help us to preserve the lake and have a fun game of golf at the same time. The format supports all golfing capabilities … from the very good to those that have only played mini golf! Bring your family, bring your friends, or just sign up and come out (individuals, twosomes, etc. can and will be paired up) … if you want to play, you can, if not, we can always use volunteers for the event. All are Welcome!! The format is a Shotgun Scramble. Shotgun means each group (foursome) starts out at the same time from different holes. The Scramble part means everyone hits a drive on each hole. From there, the team selects the best shot of the group and everyone in the group hits their next shot from there … the team continues hitting the best shot until the ball goes into the cup. So if your clubs are a little rusty, or a lot rusty, it’s a fun way to enjoy a day of golf with great folks!! And then you can enjoy lunch and buy some raffle tickets. Click the golf tournament form link below. So grab a group (meaning 1, 2, 3, 4 or more) and sign up asap!! Since we need to know numbers … the Deadline for signup is July 19, 2013. Don’t miss out … sign up now! For questions contact Bob Demer at golftournament@provincelake.org or you can phone us at (207) 200-3234. For more details about the 2nd Annual PLA Breakfast, just click the link below. How often can you go out to breakfast by boat? Only once a year, so mark your calendars! Come by water or come by land, it’s up to you. We are offering great food as well as a chance to meet and mingle with friends, family and other Province Lake lovers. 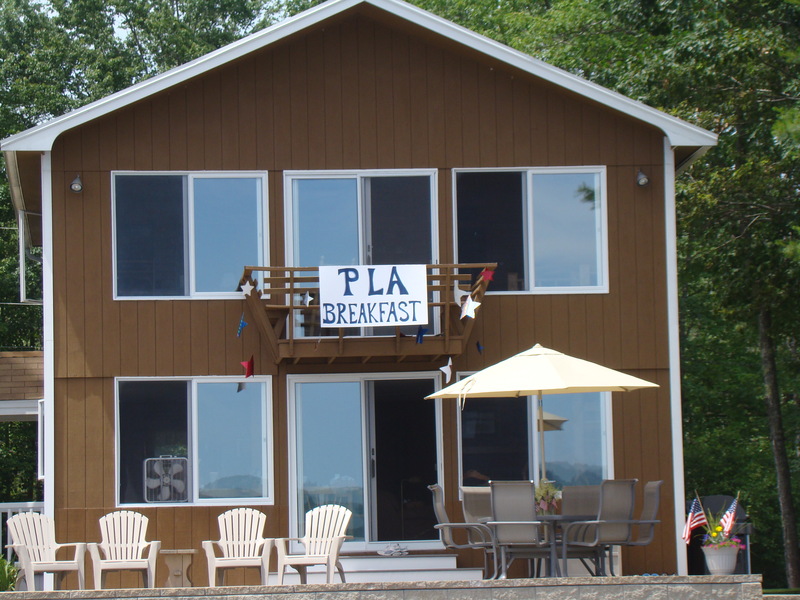 We will have boat docking for those wishing to eat breakfast with us, or we can pack in takeout containers for a floating breakfast on the lake or at your own deck or dock. We had an “eggcellent” turnout last year and look forward to seeing even more new faces this year. Make your 4th of July entertaining a little easier while supporting your Lake Association! We’re dedicated to preserving this beautiful lake for future generations. Join us for breakfast and we’ll be happy to answer any questions about the Watershed Survey that took place Saturday, May 18th or any other project that we are working on. If you would like to volunteer please email: President@ProvinceLake.org and it will be forwarded, or call 1-207-200-3234 and leave a message. In June we will have more details and the full menu posted on our new website! Check out the photos from last year’s event at the photos section of the website.